Three weeks ago as I drove off the Eurostar, I remember thinking what a very long time it was until I would be back in the UK. Now I’m planning a route home for Tuesday. Funny thing, time. The whole team is in a constant race against it. The riders have a very obvious race against the clock, but the carers, mechanics and management all face their own race too. We’ll really be up against it to ensure that the beds, washing, cars, bikes, and all the one million and one other tasks are completed, and then we’ll have a savoured moment of calm. It’s during those moments you can take a breath and appreciate your surroundings. Looking over Lake Garda, with its flotilla of yachts and sails fluttering in the breeze this morning was a case in point. The above photo does it no justice, but I thought I would try! We had a wonderful experience on the rest day that I have to mention in here. Gary Blem, our stalwart South African mechanic and veteran of many Grand Tours, let slip that he had never really been in snow before. He’s driven through it behind the peloton, sure – but never actually gone for a walk in it or made a snowman. Once we had finished up our day David, Filip (Gary’s fellow mechanics) and I bundled Gary into the Jaguar and off we set up the Jafferau Glacier to find some snow. What ensued was a mid thirty something man discovering snow for the first time. Huge numbers of snowballs quickly followed. It was just one of those moments that took us all away from the race and Gary’s first real experience of snow was a delight to us all. He is a deadly shot with a snowball, too. The atmosphere in the team camp has been brilliant over the past couple of days. There is a lot to be cheerful about, too. The sun is shining and the snow and freezing weather over the weekend are a distant memory. I fear they will soon make a recurrence, but more on that later. Today is a mountain time trial, which on paper sounds horrible, cycling uphill as quickly as possible. No thanks. The riders are pretty happy about it though. As usual Danny Pate explained it well – would you rather do a very short effort for an hour or so and then relax for the rest of the day, or spend the whole day in the saddle – again. The time trial is only 20km or so, and the only rider who will be attacking on it is Rigo, who will be trying to put time into Cadel Evans. The others will likely be trying to conserve energy as much as possible for the next two days. The next two stages are what the riders will have watched as kids and dreamt of becoming pro cyclists [Editor’s note: Since this was writter, Friday’s mountains stage was cancelled due to snow]. You can see a collective twinkle in the eye from them when we’ve been discussing it. Classic ‘high mountain’ stages, the routes take in iconic locations such as the Tre Cime De Lavaredo, and who knows what may happen on the mountain roads. It’s one of the reasons everyone is looking forward to it – the racing will be unpredictable and fierce, but very exciting. 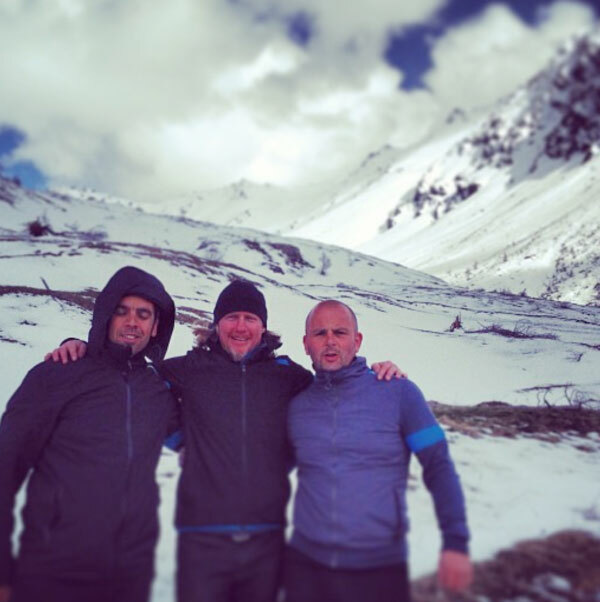 The team are all mountain specialists and they live for this. Maybe a little sadistic, but true. I’ll be paying close attention. 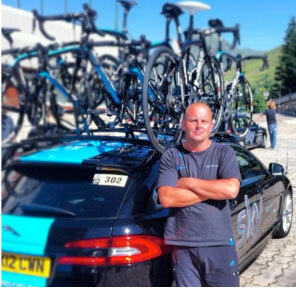 Martin Ayres has worked at Jaguar for over twelve years, and once again joins Team Sky as their performance engineer during the Giro d’Italia, Tour de France and Vuelta á Éspaña in 2013. Having not ridden a bike for over 20 years, Martin is a recent convert to the sport after his experiences with the Team in 2012 – including during their historic winning campaign for the Tour de France.